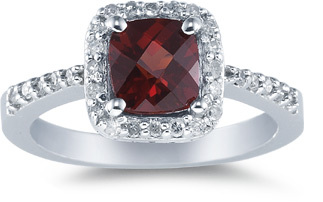 A beautiful, high quality 6mm cushion-cut garnet gemstone set amidst white diamonds in 14k white gold. Garnet weighs a total of 1.30 Carats. We guarantee our Cushion-Cut Garnet and Diamond Ring, 14K White Gold to be high quality, authentic jewelry, as described above.